Even the Kung Fu Panda enjoys the tasty delights of Cannes. Cartoons at a super-serioso film festival? Mais oui, if the festival is Cannes, which has been hospitable to animation from the start; Walt Disney's Make Mine Music and Dumbo won prizes the first two years. More recently, DreamWorks' Shrek had a lavish premiere here; and last year Marjane Satrapi's Iranian-French animated autobiography Persepolis copped the Jury Prize, on its way to international renown and an Oscar nomination. (But never a Pixar movie, though several would have been ready for a mid-May slot. Go figure.) 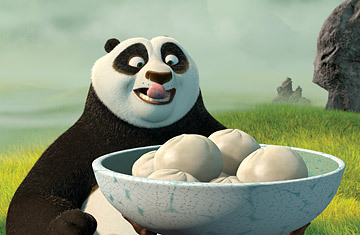 Today DreamWorks unveiled its latest ani-movie, Kung Fu Panda. As cunning visual art and ultra-satisfying entertainment, it proved an excellent choice. In ancient China, a pudgy young panda named Po (voiced by Jack Black) dreams of "legends full of legendary warriors whose exploits are the stuff of legends." In these Technicolor daydreams, even the legendary Furious Five are no match for a panda's bodacity. In real life, or as real as a cartoon fantasy gets, Po is the waiter in the village noodle shop run by his father (James Hong)  who happens to be a goose, but never mind. When Po hears that the thousand-year-old turtle Oogway (Randall Duk Kim) is to anoint the Dragon Warrior that day, he schleps his noodle wagon to the ceremony and, through the some mind-numbing plot contortions, is declared the new kung fu hero. There must be some mistake. He's a clumsy doofus for whom rising from a supine position can take all morning. Yet he is the one chosen to battle the evil master Tin Lung (Ian McShane), who'll be breaking out of prison any moment now. KFP, from a clever screenplay by ex-King of the Hill writers Jonathan Aibel and Glenn Berger, is a tribute to the literally hundreds of '70s Hong Kong martial arts dramas that flooded Saturday-morning U.S. TV in the wake of Bruce Lee's success with Enter the Dragon. The plot, of a laggard who undergoes rigorous training to become a great fighter, is familiar from many Jackie Chan films, including the one that made him a star, Drunken Master. Fans of Chang Cheh's Five Venoms movies will have no trouble spotting this movie's Furious Five: the Crane (David Cross), Viper (Lucy Liu), Mantis (Seth Rogen), Tigress (Angelina Jolie) and Monkey  voiced by Chan himself, as a way of lending his vocal blessing to the project. Chan's confidence was well placed. Directors John Stevenson and Mark Osborne may have an unhealthy fondness for humiliating physical humor  there are more sight gags of fat creatures hurting themselves than in an entire run of Super Bowl commercials  but they are essentially respectful toward the conventions of martial arts films and the Zen spirituality underlining them. Once Po stops tripping over things and devotes himself to the exhausting curriculum devised by his Shifu (Dustin Hoffman), the movie shifts into high martial-arts gear, with some sequences so smartly thought out and spectacularly executed that they might have been designed by an ace stunt coordinator like Yuen Wo-ping. One scene, which has Po and Shifu dueling with chopsticks, stilts and tree branches to grab the last available dumpling, is an instant classic. I wish Po were more persuasively drawn; visually, he's just not a charming character. But all the others are, especially Shifu, who is a wonderful conveyor of emotional nuance. There's heart in his art, and in the movie as well. That's the secret ingredient for a traditional animated feature, even one as kung-furious as this. For the seven decades since Walt Disney made Snow White, most animated features have followed the Disney mold: cute and colorful, with talking animals and a coming-of-age plot meant to inspire and amuse. Even a seeming exception like Persepolis found saving humor in its girl-grows-up story. Ari Forman's Waltz With Bashir is a break from all this: an animated documentary about the lingering, subterranean effects of war on the director and some old friends who had served in the Israeli Army during the 1982 incursion into Lebanon. The are still haunted by the massacre of Palestinians in the Sabra and Shatila refugee camps, perpetrated by followers of the assassinated Christian Phalangist leader Bashir Gemayal. One friend tells Forman of a recurring nightmare: 26 wild dogs gallop through a town and stop to howl menacingly at the man's window. He explains that when Israeli soldiers neared a Lebanese town, dogs would bark at them alerting the locals to invaders, so his job was to shoot the dogs. Forman gets to wondering what experiences of war he may have repressed, and this leads him to interview other veterans of his brigade. The movie was first shot as a regular video, then stylized (by Yoni Goodman) into its current form, using three forms of animation: Flash, old-fashioned cel and state-of-the-art CGI. The look is spare and evocative, with simple renderings of the conversations that splash into hallucinatory images of the soldiers emerging naked from the sea, a man finding refuge on that sea in the raft-like body of a huge, beautiful woman. Forman's background is in documentary films, plus a stint writing for the 2005 Israeli miniseries adapted for HBO as In Treatment. (He wrote three episodes for the series' haunted soldier, who was played by Assi Dayan, the son of Defense Minister and war hero Moshe Dayan.) Like generations of Israelis, Forman grew up in a country that is besieged by hostile neighbors even as it occupies land the Palestinians consider their own. That twin feeling, of being both prisoners and police, might give anyone restless dreams. But the soldiers whose commanders did nothing to stop the 1982 massacre, while injured women fled from the camps begging the soldiers for help, are especially susceptible to long-term remorse. Though the war was decades ago, and the combatants middle-Eastern, the issues the film raises are in no way provincial. Waltz With Bashir should touch all those who see it  both the vast majority who have been raised on gung-ho war movies, and the small minority who find that the truth is the opposite of the fiction. "It's like nothing you've seen in American movies," Forman has said. "No glam, no glory. Just very young men going nowhere, shooting at no one they know, getting shot by no one they know, then going home and trying to forget. Sometimes they can. Most of the time they cannot." In this sense, the movie might have been made about Americans today. We can debate the toxic consequences of the U.S. occupation of Iraq, but an equally troubling and potentially more lasting question is the effect of the Iraq occupation on U.S. soldiers. The dreadful nature of that conflict hasn't touched most Americans. Its troops alone bear the scar of war; they carry it home with them  if they come home  and those nightmares may never end. Waltz With Bashir is about the cold fingers of memory that clutch the heart. Forman's exemplary film says that only by exposing the wounds can they begin to heal. The message of the futility of war has rarely been painted with such bold strokes.